It's hot and sweat trickles into my eyes. Damn it, this kayak's heavy. Loaded with equipment, food, cameras and rescue equipment I guess it weighs in with 80+pounds. The thorns of this Nepalese rainforest tear through my skin and I can feel the crawlies closing in. Still there's no time to worry about anything but keep on moving. It is necessary to keep track of every step just doing the wrong thing in this remote gorge wouldn't allow for any rescue. Nikolai Timonin and I were crazy enough to try to attempt this massive gorge by two only. Anyway, we are not two nutters trying to do the impossible. We have done a fair amount of research about this river and kayaking out in remote gorges is what we have been doing over the last few years successfully. 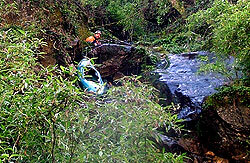 I already gave up shouldering my kayak but decided to just push and pull it through the brush and along the steep cliff. Every now and then it is necessary to use the ropes to cross sheer cliff sides. The rain gives some relieve and that we are at an altitude of 7000ft only shows by the steam coming of our dry-tops. Walking along steep slippery virgin rainforest is an exhausting task, especially with all the weight. There is no time to consider consequences but only time to make every step with thought and care. 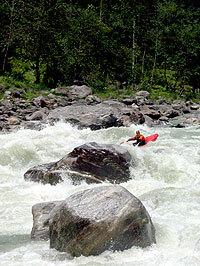 I shouldn't complain anyway, as all this was my idea to go up the 'mightiest' river of Nepal. Higher up the river then anyone else ever tried and then even trying to cross the border to China if the situation allows it to explore more of some very remote stretches in the Himalayas. That the area is clogged with Maoists (local guerrillas) didn't really bother, as usually they wont create too much of a headache as their struggle is against the local government and not some international terrorism act. But that should already be enough from the political side, back to the river. 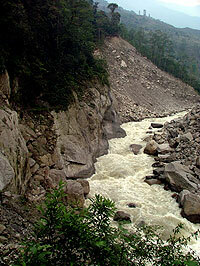 The Arun drains a big chunk of the Himalayas, including the North face of Mt. Everest (8850m), the Makalu (5th highest peak in the World) and a massive area of unnamed 7000m peaks in Tibet and Nepal. To top this one, the Arun is only one out of 4 rivers which was there before the Himalayas got created millions of years back and so the gorges had to be deep. The area itself is hardly visited by foreigners and according to the locals there won't be more then 2-3 people showing up per year and they are usually from some sort of NGO (Non Government Organization) or other project. We didn't expect to get Snacks and cakes every few miles anyway but, we looked at hard walking over badly maintained trails through remote villages battered not only by the weather but also lack of maintenance due to the ongoing civil war. To keep most of the headaches down we tried to be in the area during the driest time of the year just before the onset of the snowmelt. 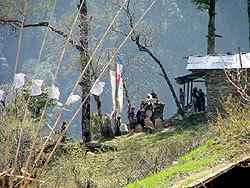 This is usually mid February in the Himalayas but so far for the plan. After Nikolai Timonin had problems to keep his time schedule and I wasn't keen in going fully solo, we ended up to arrive on the 24th of March. A bit later then planed but still full with hopes to do the impossible. To add worse to bad, once we started walking we had 7 days of rain in a row. 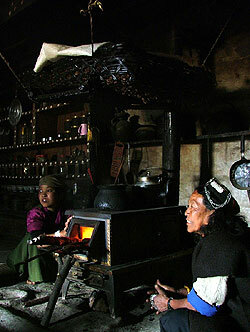 Something I wasn't able to remember for this time of the year even after staying in Nepal for 8 years. But so there we are, ready to move up over 3000m passes, through rarely traveled country with a river which sound's still is easily heard up on the trail 1.5km above. On our first sight of the river while we landed in Tumlingtar we were still good spirits (it hadn't rained yet). A blue snake well settled in its low water range made its way slowly down from the huge white giants barely visible in the background. Charged with anticipation of what it is going to be higher up we didn't waste time and started to move the well trodden path towards Makalu Basecamp. I won't bother you with talks of spectacular mountain views or similar stuff along the trail. So getting up was the goal and it took us 7 days hard walking to reach Khematanga the border town between Nepal and China and a place George Mallory (The first guy trying to climb Mt. Everest) used as his escape route in 1923. The river had changed considerably over the last view days of rain from the few glimpses we were able to have from the trail high above the river. The only time we were close to it was when we crossed the bridge from Num and it showed us a nice slowly moving river well settled in its low water bed. A portage spot from 800m above the river (I knew that place from a previous expedition) and now the river was brown and silty. The scouting places showed us a churning mass of water tumbling over house sized boulders through siphons and into deep abysses. The put in spot seemed to be the only piece of flat water giving us a 200m warm up ride before we had our first scout. A long 300m rapid with big pour overs and a fair amount of siphons showed. Ok, to not push we went straight for this easy portage and put in below to have some more warm up on some grade IV+ water. Two longer rapids and from far we could already see the gorge walls climbing up some 600ft on the left hand side and a clear horizon. We knew that spot having scouted it from high up already. The right hand side was the obvious choice for the portage but gave us some 2hrs hard bush whacking, climbing and trashing through the jungle before we finished the roughly 2 km portage. Back down at the shore, the river didn't seem to let go, dropping at an insane speed with way too much water. We had calculated (according to eye witness reports and photos from a Russian team which went on this river on the Tibetan side) that the flow in February should be around 2000Cfs and the average drop 150-180ft/ml. something which can be done but a big snow year all over the Himalayan range, our late start and continuous rain made the river swell. An estimated 4000Cfs went down the river now and most of the rapids looked were run able if there would be a pool or a slower section in between but all it showed was one long rapid. That there would be a fair amount of portages (we calculated 50%) isn't anything new on a first descent down a river in the Himalayas but we ended up to carry some 80% of the rapids in the first gorge. The 14km stretch which we thought we would tackle in one over nighter became an endless task of ferry gliding, scouting for possible portages over boulders or through the jungle, climbing up cliffs, roping boats, fighting leeches, ticks, rain and exhaustion and we hardly managed to kayak some of the rapids. There's a grade IV in between two terminal grade VI's and it just becomes difficult to go and do the otherwise easy run. The moving is hard and we sit down to have a short brake. Everything is soaked from either sweat or rain, even the cameras wont really work but steam up immediately once out of their waterproofed cases. There's not much to say between Nikolai and me. Our looks tell the story and thoughts we have to each other; we are exhausted, frustrated, scared and ready to brake out of this gorge anytime it gives us a way out. The bouldering with boats, ferry gliding and climbing along ferocious water masses doesn't really build the confidence to keep kayaking hard water. There was just nothing but the odd IV to go in for and the rest just seemed to be relentless. The first night we spend on top of a small overhanging rock. Starring into the fire it was a quite and wet camp with the thunder of the river overwhelming every other sound. The rain stopped at around 1800hours (nightfall in Nepal) but also that couldn't cheer us up really. We were busy picking of ticks and other crawlies which went on us during the day, munch down our cut down rations (we started to make 4 nights what usually was rationed for 2) and went through the days happenings in our mind. It wasn't a comfortable night either with more crawlies coming in 'exploring' the new kind of taste offered, barely enough space on the rock for two and with the onset of rain again in the early morning hours. A short breakfast and as we camped just above another mandatory portage, we immediately started to work our way along some animal trails until we got stucked. The fear which always sits inside you once you are in a gorge. The rapid looked hard and scary, especially as we couldn't scout the bottom part of it. The bottom part which looked the most hard and the part which from far showed a strong hydraulic across the river. As there wasn't anything to be done from the shore we jumped into the boats after some long thoughts and discussions. Together we headed down with some bad feelings in our stomachs. With a slow approach we tried to boat scout something which we couldn't see and aimed for what we hoped would be the least sticky place. When I entered the no return spot time was going slow and all focus went for the hoped spot of flush which showed at the last moment and both of us were on the right track towards it. Nikolai went in first and I saw his boat getting chewed up right away. There was only a split second to decide, I went a bit further left and did hit a softer spot of the hole. Once I rolled up I looked back, fearing the worst for Nikolai. He still got worked. While I tried to make the next eddy I looked back, checking what we would be up for just downstream. Nothing good I knew from the glimpse I got. Some lucky seconds later Nikolai got flushed out. We knew it was enough of trying in this gorge from that time on. Even while we kayaked more stretches then on our first day in the gorge it was time to call it quits. Small mistakes like that with such a small team don't allow for the slimmest of margins. A side creek a few portages and rapids later was the place we were looking for. We knew there still was enough grade IV-VI whitewater further down the river but up here we just were too late in the year. We had to call it quits. A bitter bruising but something were you just can't change the odds. Nature wins and sometimes doesn't want to be played with either. The hike up the creek obviously wasn't an easy task but it released the tension we both had build up while going through this 12km section of craziness. It wasn't that we were tired, weak or exhausted it just was a tension you build up when you know, that no mistake is allowed. Not while walking or portaging and not while on the river. Every corner can show you the bitter truth of life and death. We were sour after the hike back. Even as we promised each other not to look back it again looked all feasible from the trail. Obviously we started contemplating to go back in, but in the quite moments we knew we wouldn't. 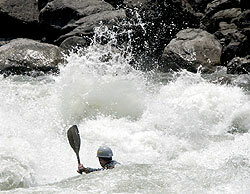 It was time to head back, head back to the stretch of whitewater which we knew can be kayaked (at least most of it). 2 days walking back we were finally on the water again. This stretch had been kayaked by a handful of people previously and is considered as some of the hardest water in Nepal (people consider the Humla Karnali or Thule Bheri difficult but this one tops it a notch easily). Nonetheless, it was way easier then the upper stretches. 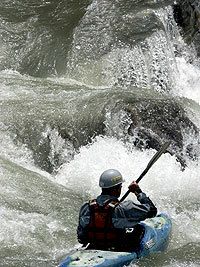 Most of the rapids you had to scout and we had some portages in there but overall it was feasible big volume. The release of tension from the upper section did let us fly down the river in a unison and we easily dropped into this feeling were you can just go with the flow and everything seems to be right. There were still some portages in the upper part and a 2hr portage in the middle and 2 shorter portages further down. They all seemed to be a hike compared to what we were up to on the upper stretches. Some great V whitewater was building back our confidence after this near technical knock out on the upper stretches and we did fly down this stretch of whitewater in 2 days which is considered a 5 day whitewater mess. Everything seemed to be easier in comparison, the holes smaller, the water slower and the pools bigger. Our last camp looked way different then any what we had experienced higher up. We were on a flat stretch of the river, it was warm as we dropped down to an altitude of about 600m and it didn't rain. The weather had pulled the curtain of apprehension away from us and we felt good. We felt good at what we had attempted and achieved. By comparing rivers we had kayaked from all over the world, even the stretch which we enjoyed was way harder then anything else yet. Remembering the madness on the upper most stretches we just laughed at each other. We laughed at our try to win against the odds. But nonetheless we will be back to tackle this river at better flows. Reworking and rethinking what we did see on this attempt we do know, that there is a possibility in lower flows with a stronger team. Be our guest.